236 June 1946. July 1946. The W.C.T.U. met June 16 with Mrs. Lena German at the home of her daughter Mrs. L. R. Terpstra. Devotions were by Mrs. Jackson and the program by Mrs. McBlain, on the topic, Home & Influence. At the business session, plans were confirmed for having a family potluck picnic at the July program, the program to be at 2:30 in charge of Mrs. Ralph Allen, devotions by Rev. A. W. McBlain, and the potluck at 4 P.M. A temporary report of the nominating committee was read and approved the committee being retained until a final report can be submitted for adoption. One dollar was voted to Edna Sherman, chairman of the Public Relations Department, for postage. Adjournment. Ada Park, secretary. 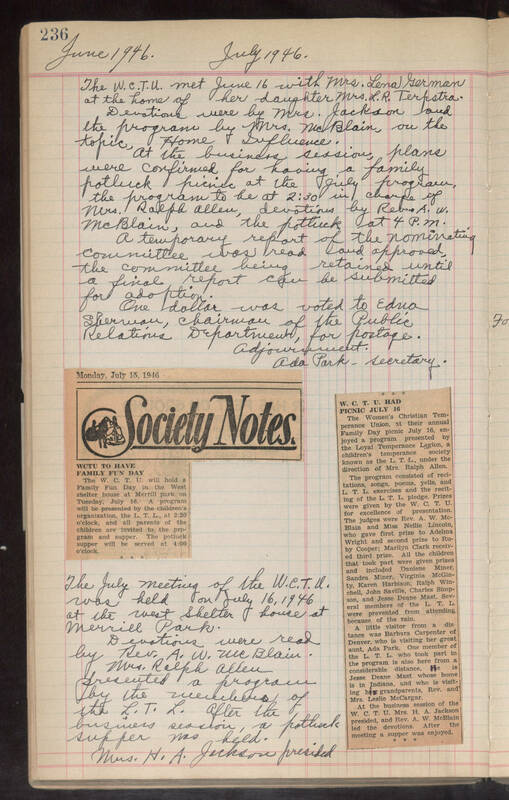 Monday, July 15, 1946 Society Notes WCTU TO HAVE FAMILY FUN DAY The W. C. T. U. will hold a Family Fun Day in the West shelter house at Merrill park on Tuesday, July 16. A program will be presented by the children's organization, the L. T. L., at 2:30 o'clock, and all parents of the children are invited to the program and supper. The potluck supper will be served at 4:00 o'clock. The July meeting of the W.C.T.U. was held on July 16, 1946 at the west shelter house at Merrill Park. Devotions were read by Rev. A. W. McBlain. Mrs. Ralph Allen presented a program by the members of the L. T. L. After the business session, a potluck supper was held. Mrs. H. A. Jackson presided W. C. T. U. HAD PICNIC JULY 16 The Women's Christian Temperance Union, at their annual Family Day picnic July 16, enjoyed a program presented by the Loyal Temperance Legion, a children's temperance society known as the L. T. L., under the direction of Mrs. Ralph Allen. The program consisted of recitations, songs, poems, yells, and L. T. L. exercises and the reciting of the L. T. L. pledge. Prizes were given by the W. C. T. U. for excellence of presentation. The judges were Rev. A. W. McBlain and Miss Nellie Lincoln, who gave first prize to Adelma Wright and second prize to Ruby Cooper; Marilyn Clark received third prize. All the children that took part were given prizes and included Daniene Miner, Sandra Miner, Virginia McGinty, Karen Harbison, Ralph Winchell, John Saville, Charles Simpson, and Jesse Deane Mast, Several members of the L. T. L. were prevented from attending because of the rain. A little visitor from a distance was Barbara Carpenter of Denver, who is visiting her great aunt, Ada Park. One member of the L. T. L. who took part in the the program is also here from a considerable distance. He is Jesse Deane Mast whose home is in Indiana, and who is visiting his grandparents, Rev. and Mrs. Leslie McCargar. At the business session of the W. C. T. U. Mrs. H. A. McBlain led the devotions. After the meeting a supper was enjoyed.